The dizzy growth of our cities has generated a completely legislated landscape and before that some of them begin to propose new strategies of use and occupation. 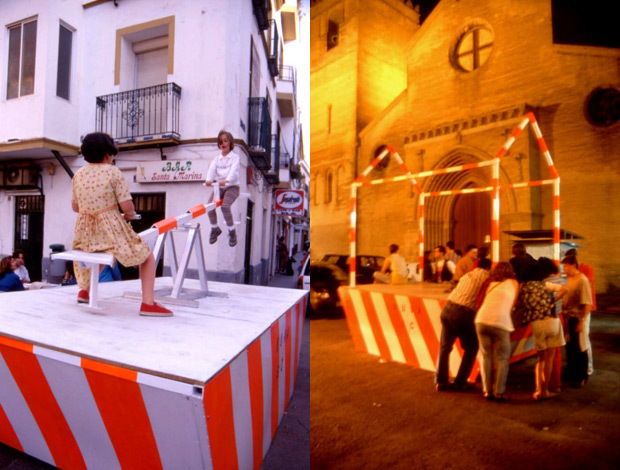 Children playing in his new zone of playtime of the San Luis de Sevilla Street (1997) | The neighborhood achieved a place of meeting to organize holidays in spring. Along the history, the character of the cities has been forged of intuitive form by his citizens. The recent demand of growth of the same ones has had like proved, nevertheless, the extension of avenues and the creation of visual perspectives that facilitate the access of the authorities for a major vigilance and urban control. The question that remains opened is if still there exists some possibility of incorporating those former individual freedoms that created our cities, if still it is possible to work inside the frame of the urban development regulations to obtain an alive solution that reflects the social contemporary diversity. As way of protecting the historical centers, many cities have decided to close his streets to the traffic and only to allow the free access to the residents. On the other hand, to preserve the image of these areas, the same residents are forced to support the colors in the fronts, to use certain materials and constructive solutions, and to reconstruct in agreement with this well versed order. In a historical scene, therefore, the interior of the city is subject to severe restrictions that affect citizens with a completely heterogeneous attitude towards the own physical image, with regard to the way of dressing, to his hairdoes, tattooes, cars or mobile phones; individuals who have managed to resign even his intellectual and cultural convictions. The freedom that former the citizens had to modify his properties and, with it, the immediate environment, is now seriously limited; and in his attempt of realizing a reform, the licenses of construction are refused to them automatically if the parameters or given regulations are not satisfied. Under these circumstances the contemporary life in certain places can manage to be a pastiche of paralyzed history. Opposite to this inflexibility, the architect Santiago Cirugeda is reading between the lines the urban development planning of our cities to offer, without breaking the rules, a few new possibilities of use to the citizen. A scene of his work is the historical center of Seville, city where he lives, and that is characterized by the extreme saturation of the soil and by a few regulations formulated to support the visually intact environment. Therefore, if the neighborhood was needing a new urban element, since it can be a zone of games or a center of information, it would turn out practically impossible to find a vacant place. After studying the urban regulations, Cirugeda projected a temporary solution to which it called ” To recover the Street ” and which consists of the use of a container of rubbles re-designed as zone of games, point of information, room of reading, explanatory space, tablado Fleming or giant flower-pot stand; an urban authorized element and that can be displaced by facility. The architect studied the total cost of the operation and provided the clients with a manual of how obtaining the permission of the Management of Urbanism for the installation of a vat. Once obtained the permission, the container of rubbles can be placed and adopt the function needed by the clients. This enterteining action provokes a reflection on the urban inflexibility that surely should turn out to be more accessible to the civil participation. What does happen when the same clients want to extend his properties in the historical center of Seville? This implies that the citizen would have to realize the work illegally. The extension of one of these housings to make her more inhabitable, an operation very common and generalized former in the cities, would not obtain today the corresponding license of works. A way of proceeding suggested by Santiago Cirugeda consists of the use of scaffoldings to construct on him a room. For it it is needed to follow the procedure simple to request to the Management of Urbanism a license of minor work to paint the front of the building to extending. Depending the degree of patrimonial protection, the only requirement would be to respect the existing color. In this point, Cirugeda advises that if the front does not need a lick of paint, always they can paint a few graffitis to justify the works. After asking for the license, which also can be obtained without refilling the cabin that defines the duration of the work and to do so it lasts indefinitely, one can then construct on the scaffolding his urban refuge using forms and materials according to his taste. 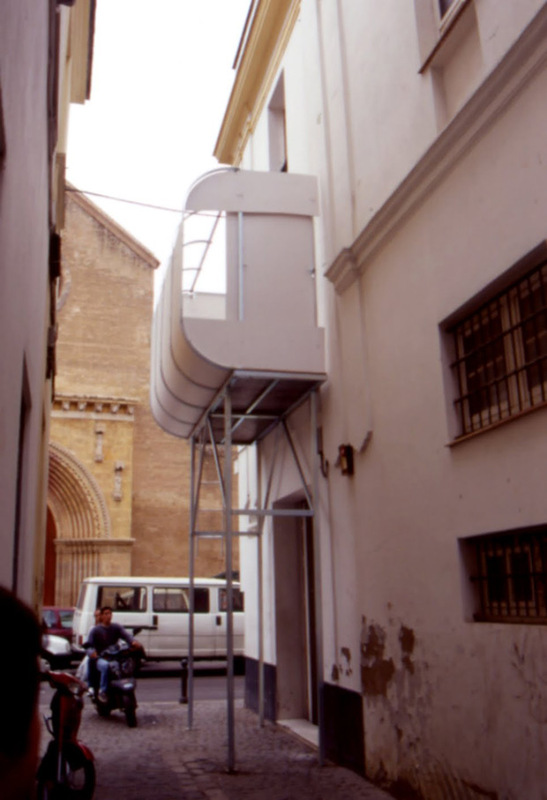 Another project also realized in Seville consists of recycling lots in disuse by means of prefabricated detachable structures, which has allowed to Cirugeda to enjoy an office in different locations of the city. Nothing can do Heritage opposite to these architectures – objects since they are not regulated by those stylistic ordinances that, as Cirugeda denounces, “they govern the inhabitable theme park into which the ancient city has turned.” A contract of electrical assault done to an individual near to the lot and a few sanitary portable cabins of chemical functioning they are some of the options that help to make inhabitable these nomadic urban constructions. 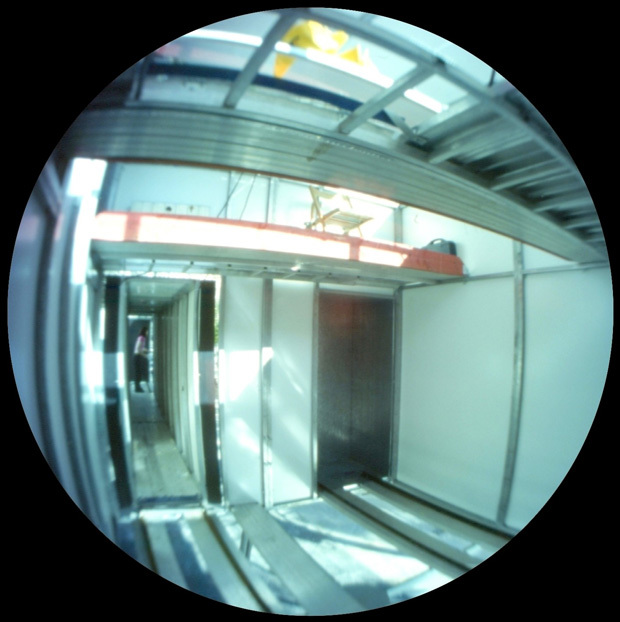 The placement of a prefabricated module adjusts to the supposition of the Art. 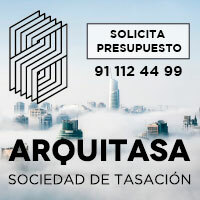 3.40.1.c Scatterings with provisional facilities of detachable character, of the PGOU of Seville, which regulates the duty of Specific Conservation and Temporary Occupation of Lots. On the other hand, to the being our module a capable object of ” transporting from a point to other one without damage of the thing building to which it will be joined ” (Art. 335 of the Civil Code), and not being joined to the lot ” in a fixed way without it could not separate of him without breaking of the matter or deterioration of the object ” (Art. 334.3 CC), besides that it is not also joined in a permanent way or with the intention of which it manages to form a part of the estate, there is understood that we are clearly before a personal property. For all this, the placement sequenced in the different chosen lots would be completely free and would not surrender to any normative restriction that forces us to request authorization. 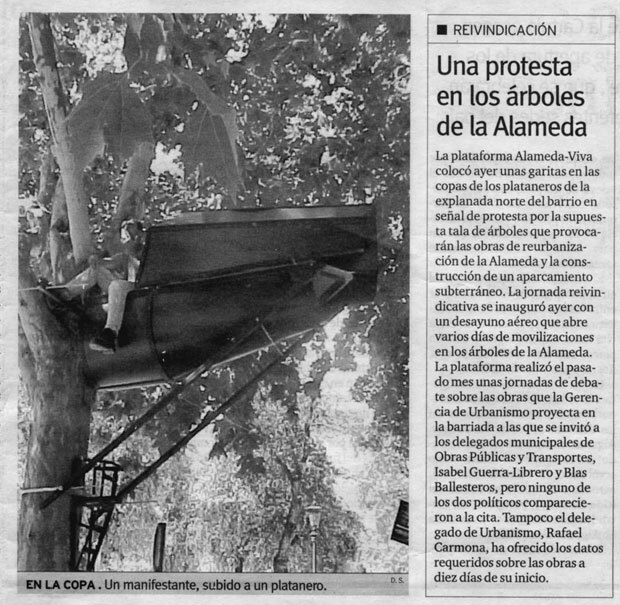 When Santiago Cirugeda was invited by the platform Alive Avenue to help to avoid the felling of The Avenue in Seville, this one constructed the house – insect. 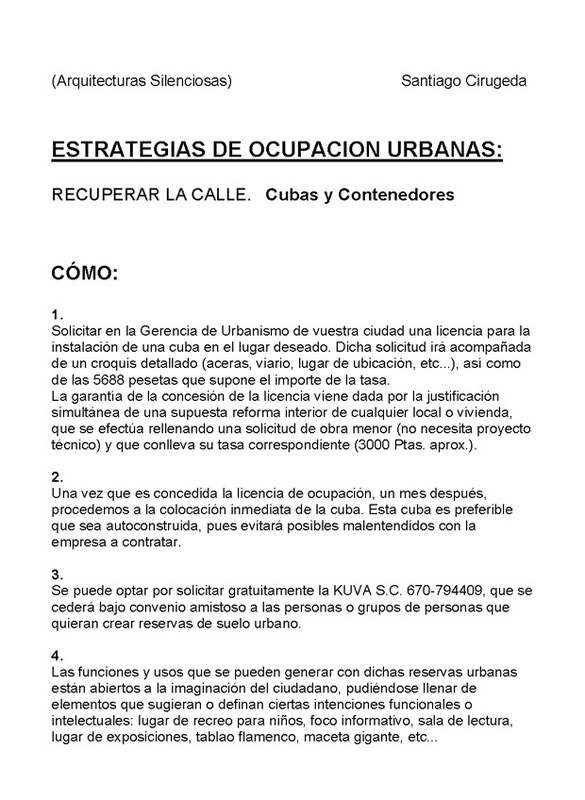 Beyond being a refuge of urban guerrilla warfare placed on a tree and with a protection framework to opposite to possible aggressions with balls of rubber or jet of water, the project helps to ” recodar that in the development of the city, the individuals and human groups continue having a capacity, though reduced considerably, of acting and deciding on the use and way of acting on her. ” As the previous projects, this one is a solution that does not try to provoke the local authorities but of arousing the citizens with major commitment with his habitat. The work of Santiago Cirugeda is an architecture that grants to the citizens possibilities of use and of participation in the construction of his environments, and with it, of gaining freedom.